This morning (July 20th), as I was praying, I was impressed to read Isaiah 17, 19, 21 and 23. I didn’t remember at that moment exactly what those chapters were about until I read them once again this morning. As I was reading and praying through this, I believe the Lord was saying that we are entering a time of the greatest fulfillment of these four passages. What are these four chapters about and have they already been fulfilled? Isaiah 17 and 19 have yet to be completely fulfilled, while Isaiah 21 and 23 have seen fulfillment, but I believe will see greater fulfillment in the near future. These chapters are primarily regarding Damascus, Egypt, Babylon (Iraq) and Tyre (Sur/Sour), Lebanon, respectively. I will very briefly summarize the good, the bad and the ugly implications of these four chapters. I would encourage you to read and pray through these chapters as well. As you probably know, Damascus has been at a center of a war. Damascus is in the southern portion of Syria, near the northern border of Israel. I believe we will soon see an escalation of this conflict, resulting in the complete destruction of Damascus. Damascus has seen conflict before, but has yet to cease from being a city. This prophecy is yet to be fulfilled. This time will be a tumultuous time of upheaval , war and conflict. However, there are good things that will come out of this time. The remnant may seem small as these conflicts move forward, yet they will still remain. As these times continue into deeper times of distress, many will begin to look to the Lord their Maker. We must remember that our Lord God will have the final say in this matter and will tear down earthly kingdoms and set up His Kingdom here on this earth. “At evening time, behold, there is terror! Egypt has recently been through difficult times. They have been through upheaval in their government. President Hosni Mubarak was overthrown in 2011 during the Arab Spring uprising. The Muslim Brotherhood representative Mohamed Morsi was elected in 2012. President Morsi was then overthrown by the Egyptian military in 2013. President Adbel Fattah el-Sisi, the former military general who led the coup, was elected President in 2014. Egypt has since been fighting against both ISIS and the Muslim Brotherhood. Where is Egypt headed? Even though Egypt has been fighting against ISIS and the Muslim Brotherhood, they are still in a period of relative calm and stability. However, the scriptures tell us that there will be an increase in conflict in Egypt. Nonetheless, there will be a remnant of believers that will survive in Egypt…and Egypt will end up being a blessing to the Lord! In the midst of very difficult and trying times, the Lord with visit Egypt and draw out of her His beloved inheritance. Recently, Iraq (ancient Babylon) has been abandoned by the US, giving way to the influence of Iran (ancient Persia) in the government, and ISIS across its country. In 539 BC, Persia, under Cyrus the Great, and Media, under Darius the Mede, conquered Babylon. They subsequently released the Jewish people from captivity, allowing them to return to Jerusalem and reconstruct the Second Temple. In current times, we have seen Persia (Iran) regaining control of Babylon (Iraq). There will be further conflict in this region. 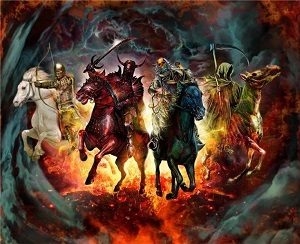 We do know that once again Babylon will fall, as will ultimately the global Babylonian anti-Christ governmental, economic, religious ruling system. Jesus will return and rule on the earth! O my threshed people, and my afflicted of the threshing floor! The God of Israel, I make known to you. Modern day Sur (or Sour, which is the ancient city of Tyre), located in southern Lebanon near the northern Israeli border, has seen many conflicts. It was overthrown by Nebuchadnezzar in c. 600 BC and by Alexander the Great in 330 BC. It has seen conflict between Israel and Lebanon in the ‘70’s as well as in ’82, ’83 and ‘06. I believe we will see the even greater conflict in this city in the days and years to come. When Cyrus defeated Tyre, the plunder provided for the rebuilding of the Temple of the Lord. We see this pattern when the Israelites left Egyptian captivity (the plunder was used to build the First Temple) and when they left Babylonian captivity (the plunder was used the build the Second Temple). I believe we will yet see the greatest transfer of wealth for the purposes of the Kingdom of God ever, as we are being “released” from the clutches of this world’s ungodly system. Lord Jesus, we give our lives totally to You and for Your purposes. Please continue to reveal Your precious plans to us as time moves forward and help us to be led completely by Your Holy Spirit, Amen! !